Yesterday I wrote about one way of dealing with anxiety. But drawing from Toni Carmine Salerno’s Universal Wisdom deck today, I’m finding more. Today I drew Sacred Mountain and Lilac Mist. Sacred Mountain is possibly my favorite card in this whole deck. If you have spent time around mountains, you know that mountains radiate beautiful, positive, healing energy. 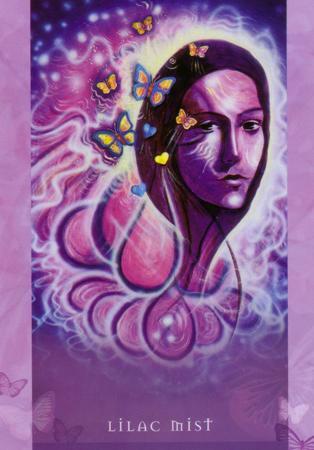 To me, this card calls us to be like a crystal, radiating positive energy outward to all nearby beings and maybe, to all sentient beings everywhere. If we are feeling anxious ourselves, becoming like a crystal is one of the best things we can do. If you do not have mountains close by to inspire you, you can hold a crystal, or even an ordinary rock, in your hand. Be the crystal, be the rock, be the mountain, and radiate energy for the benefit of others. Breathe in healing energy, breathe out healing energy. Be a stone. I love this practice. First, we neglect stones. If you have spent much time thinking about alternative medicine, or ways of dealing with feelings, or working with energy, you may have spent a lot of time thinking about being more like water. And yes, the energy of water is tremendously healing. But. In times of stress, we can also be stone. 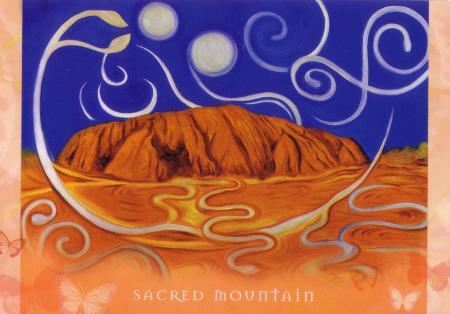 We can be sacred mountains. If we need grounding, if we are feeling vulnerable and anxious, being stone will not only help the sentient beings who we choose to radiate our positive energy toward, but it will help us too. We can connect with the earth. We can be solid and safe — and protected from the negative energy of others. Water doesn’t really help us so much with fear, in my opinion. In fact, water absorbs negative energy, so if there is a lot of negative energy around, or negative energy being directed at us, I’m not certain that water is our best role model. We can use water for cleansing purposes, to wash away negative energy, but I’m not certain that we want to “be” water in a time of fear. But rocks and stones, crystals and mountains — these are good medicine for fear. Not only does stone make us feel safe, but it helps us to pull ourselves together so we can do what we need to do (water is good for getting energy flowing, which is very important — but it can also make us prone to weepiness — which is not so helpful when you need to get something done). Second, there is always stone that we can connect with. We are connected to a massive stone, this planet, at all times, through gravity. Even if we live in a prison, we can connect with stone walls and floors. We can feel the energy of the earth holding us up. Giving us energy when we need it most. At times when the only other thing we have is air, we should remember that actually, we also have stone. Second card: Lilac Mist. This card speaks of a setback or difficulty. Something we might be anxious or worried about. But at times like these — actually at all times — we are not as alone as we think. We are surrounded by angels, by spirit guides, by bodhisattvas, by whatever you want to call them. These guides are reminding us that in addition to the resources we have on a physical level for dealing with stress (and again, whatever else we do or don’t have, we have stone and air, at a minimum), we also have spiritual resources. We have prayer, we have meditation, we have help from beings who are trying to help us whether we notice them or not. On some deep level of the soul, there is no such thing as poverty, there is no such thing as solitude, there is no sense lying behind emotions such as fear. On some deep level of the soul, miracles are possible. But to make miracles happen, you need certain ingredients, and these ingredients alone will carry you a long way: Faith. Love. And the patience and calm of a stone. Thank you. I really needed this and the universe led me to your site. You are welcome! I’m so glad you liked the post. Sorry I haven’t been updating the site much lately–trying to get back to blogging, soon.